As of late I often find myself thinking about ceremony and ritual. I've decided I want to start thinking about the ceremony Logan and I will be reciting for our wedding sooner rather than later. My recently acquired addiction to wedding blogs has resulted in much stumbling over "what we would have done better" wedding advice. One of the recurring thoughts is: "we would have taken more time to think about and develop a beautiful ceremony. We were so caught up in the pretty details that our ceremony was rather short." Of course, Logan and I have untraditional beliefs about God vs. our parents traditional beliefs (Catholic on my side and Presbyterian on his side). So this whole wedding vow thing is going to require more careful thought than it might otherwise. I follow Yogic Philosophy sans religion and Logan is Taoist at heart. How to show love to our families and honor their spiritual beliefs and yet remain true to ourselves? How to avoid offense and (even, potentially) ridicule? And, most importantly, how to communicate love and an eternal bond with your partner using terms that might be foreign to your audience? So far, all I've decided is that we'll be doing readings from a number of mystic poets and writers from traditional Christian, Buddhist, Yogic, and Sufi sects. My idea is to focus on the commonality between the different religions at the heart of practice -- the desire for a love relationship and union with the divine, god, the clear light of the void, whatever. Anyone have any ideas on alternative ceremonies? Any insight would be glorious. On another note: these are the best damn biscuits I've ever made. And this is the best (and only) jam I've ever partially-made-with-my-friend-who-actually-made-it-because-I'm-totally-inexperienced. Good for those times you're craving something buttery, crisp, with a pull-apart quality topped with springtime. Oh, and the jam. 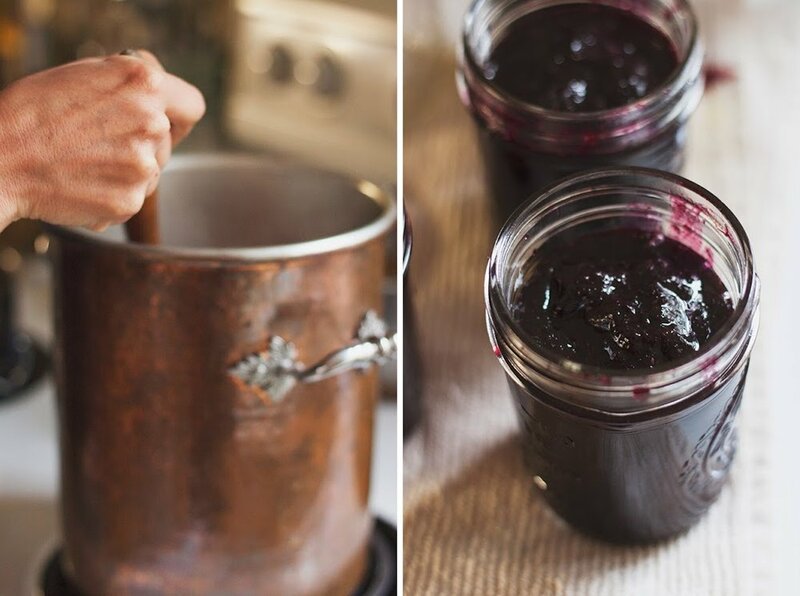 My friend Mary taught me all about the process of making and canning jam this past weekend. She has some fancy instruments for removing the jam jars and caps from boiling water which you can find at Williams Sonoma here,here and here. Here's a book on canning that I don't own but WANT. Here's a pretty good explanation of canning and how you should do it for this jam (dang people use SO much sugar for jam! Totally unnecessary!). And, hey, I kinda just threw these biscuits together so the measurements are pretty French. And by French I mean a close approximation to my haphazard yet successful taste-as-you-go methods. 5 tbsp solid room temperature coconut oil (that's around 60F, folks). Preheat oven to 450 degrees F. Line a large baking sheet w parchment paper. Mix flour, baking powder, baking soda, and salt together in a large bowl, aerating the mix as much as you can while you go. Cut in one tbsp at a time of coconut oil -- use either a pastry cutter, two butter knifes, or your hands to bring the oil and flour together. You want a nice sandy consistency, here. Make a well in the dry ingredients, and, using a rubber spatula, stir gently while adding the milk + vinegar mixture. The mixture will be pretty sticky. Using a tablespoon, scoop biscuit dough into 2 to 3 inch wide mounds on your parchment lined baking sheets. Bake 15 minutes, brushing the tops with coconut oil or ghee at 10 minutes. Biscuits are done when tops are golden brown. In a large jam pot (Mary had that awesome high walled copper pot shown above), boil strawberries 10 minutes. 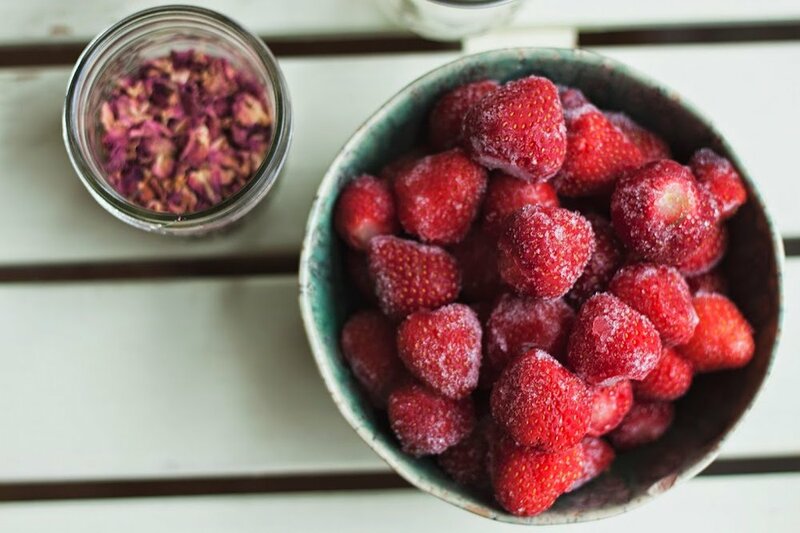 Add citric acid or lemon juice to strawberries. Mix sugar and pectin together in a small bowl. Add to strawberries, stirring constantly until it thickens up considerably. 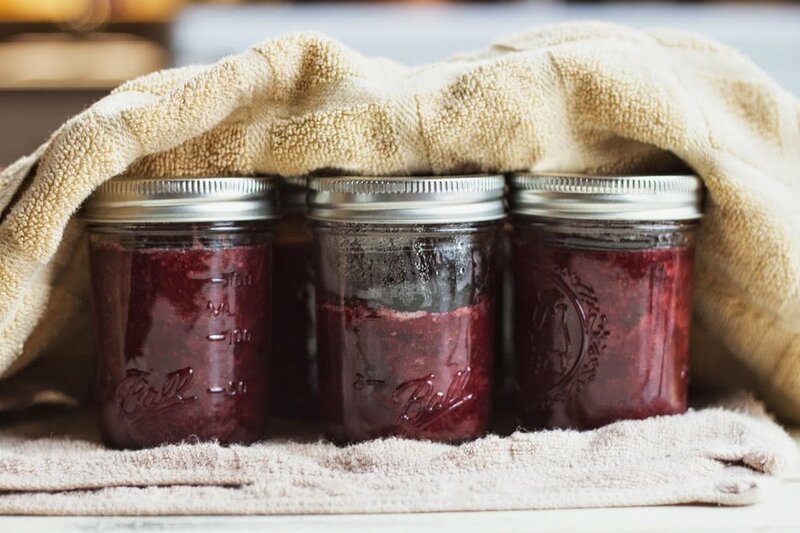 Once thick, add jam to each of your clean, sanitized jam jars -- each jar should be fitted with your funnel before you add your jam. This helps avoid getting jam on the jar edges, which can later grow toxic mold. Take a clean paper towel and clean the edges of each jam jar. Fit with sanitized lids, tighten the lids, and boil to seal the lids. CANNING TIP #1 You'll start to hear the lids *pop* when they've sealed. You may only get half of your jars to seal whilst boiling. 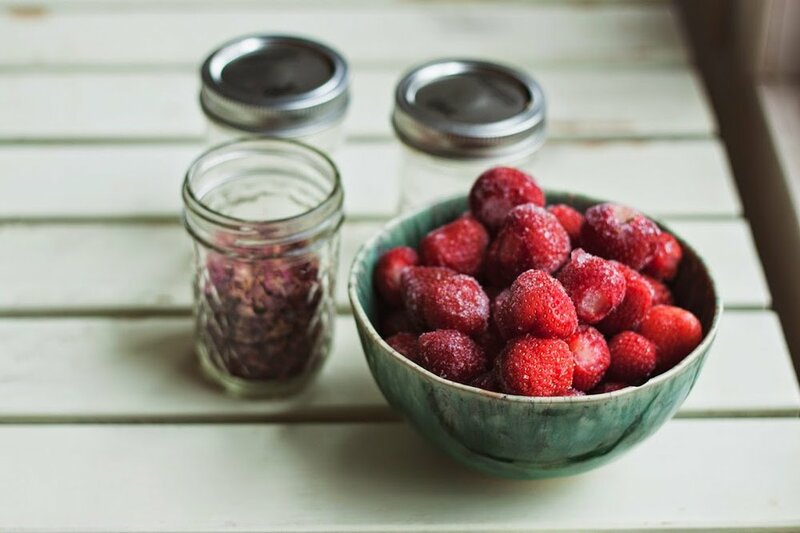 CANNING TIP #2 Allow all of your jam jars to rest beneath a kitchen towel, undisturbed, for at least an hour to overnight. This gives the jars time to seal completely. CANNING TIP #3 Your jar tops are sealed when the divot in the center of the caps is flat. The caps that are not flat -- that have that divot in the center still convex -- should be stored in the refrigerator and eaten within the week.